I mentioned earlier that I sold off my Nikon D7000 and three lenses last month. The main reason was size: Having traveled around Europe with the whole kit for a month, I didn't see myself carrying all of that weight on a trip again. 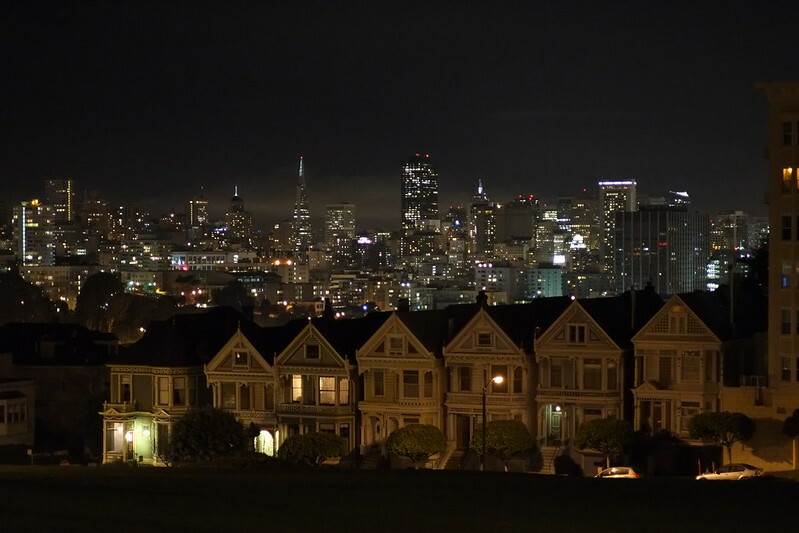 And around San Francisco, I prefer my Fuji X100 for street photography. Even more, I didn't find myself being as deliberate with my photos with a DSLR compared to the more manual and sometimes slower X100. I just enjoyed the Fuji photos more, and it was nice to not end up editing hundreds of quickly shot burst photos. I also figured that if I ever actually wanted to use a DSLR for a trip, I could rent one from BorrowLenses. I took a big hit on depreciation for the D7000 and lenses, so I wasn't too eager to jump back into another camera system, even ones that were smaller like Fuji X and Micro Four-Thirds. Jumping into the Leica system seemed intriguing, but having a need to continue eating and living under a roof, I wasn't about to spend a few months mortgage on a used M9 and lenses. 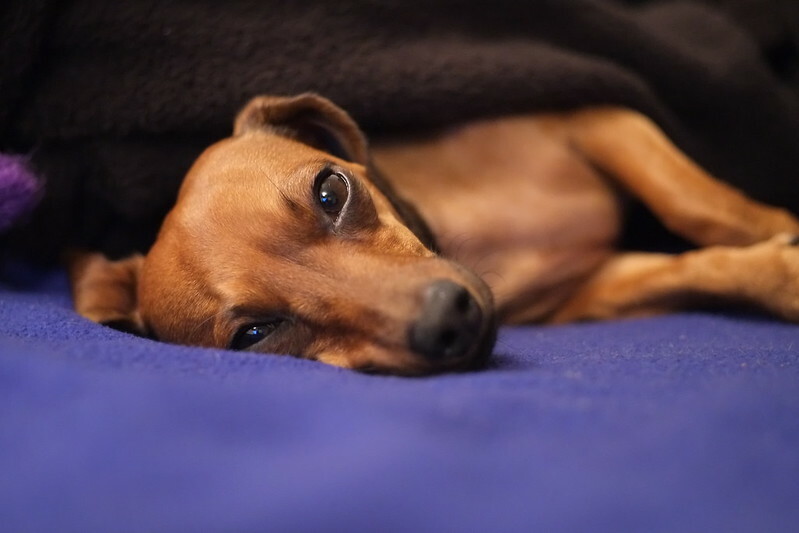 I decided to compromise by getting a new Fuji X-E1 and one used Leica lens, with the idea of eventually buying into a Leica M in a few years if I really feel like it. 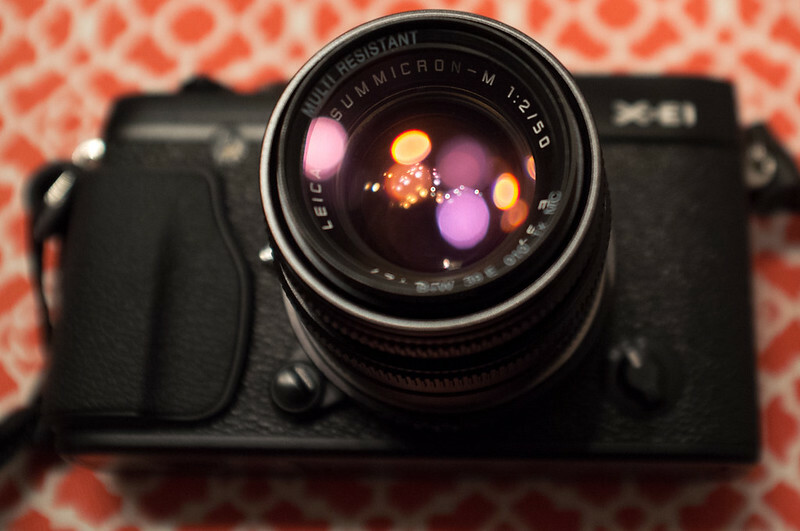 Since I already use a Fuji X100, I would be used to the controls on the X-E1, but the Leica lens would offer me something new and force me to learn manual focus. And at least I wouldn't have to worry as much about the lens depreciating in value like my Nikon lenses did. 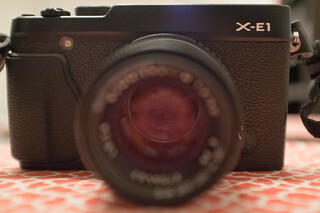 I ordered a black X-E1 body from B&H and a RainbowImaging lens adapter from Amazon. 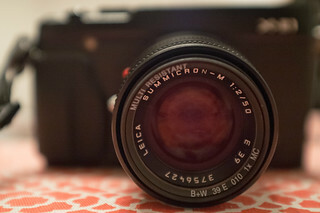 Another Googler put a Leica Summicron-M 50mm f/2 Type 5 in excellent condition up for sale and I got a good deal on it. Despite the small size of the Summicron 50, it still is a bit heavy compared to the X-E1, causing the combination to be a little off balance. You'll notice that while resting on the table it's angled forward onto the lens. Holding the camera hasn't been an issues, however. Look at that lack of noise! All of the photos in this post are JPGs straight out-of-camera with no edits, and I'm extremely happy with the results. In my next couple of posts, I'll write more about using manual focus, zone focusing, review the RainbowImaging adapter, and discuss whether using an effective 75mm lens is acceptable for street shooting.